Existing technologies of hard biopropellant incineration are briefly analyzed in this article. These technologies are used in thermal energy generation systems on renewable fuel types from domestic and foreign producers. 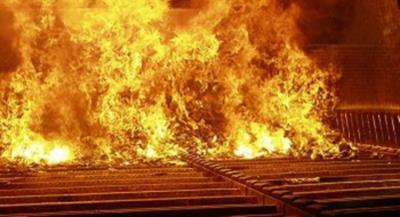 Incineration on furnace grates is the most ancient method of hard fuel incineration. As a rule, this technology is used for incineration of large-fraction and lump fuel located on a furnace grate, with the air flow blown through that fuel layer. There are modern hi-tech modifications of this technology, for example, incineration in boiling layer. Most popular and effective varieties are following: incineration on an immobile sloping furnace grate; incineration on a movable sloping furnace-bar grate. This technology allows to burn effectively all types of both refined and dry biopropellant, except fuels with high ash content and low temperatures of melting and ash agglomeration. Combustion chamber, as a rule, is parallelepiped-shaped. Furnace bars are set in cascade order (as a tiled roof), so every next furnace bar partialy covers previous one, and there is a vertical plane crack between furnace bars, through which air flow is blown through. Fuel is delivered by conveyer worm or hydraulic pusher on a topmost furnace bar. Under pressure of continiously moving portions of fuel, it moves sideway and to bottom, filling all the surface of furnace bars. Direction of air blast motion coincides with direction of fuel motion, due to what air also assists transferring of fuel towards necessary direction. In most top-quality and high-technological combustion chambers there is a special tight-fisted screen from fire-resistant material, able to work at temperatures up to 1650 °С, above the sloping surface of furnace-bars. This screen directs flame from top to bottom, in opposite direction to fuel motion. This method gives following advantages: flame makes longer way, providing more complete combustion of fuel mass; amount of sparks is diminished; flame, rising above moisted fuel mass, dries it out a little, thus improving incineration process; fuel burning process flows more intensively and with higher temperatures. Final fuel afterburning takes place on lowermost – horizontal furnace bar with crack openings through that ash spills into ash-pit. 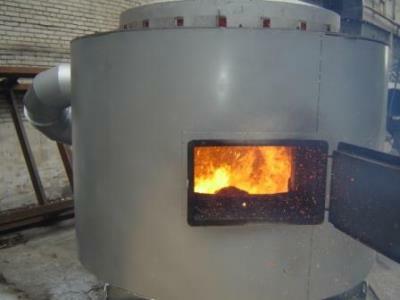 Advantages of technology of incineration on an immobile sloping furnace grate are following: maximum simplicity of thermal generator and minimal number of moving parts; low price and short recoupment time; high intensity of incineration process with minimum area of burning mirror, consequently, equipment occupies minimal area with minimal equipment mass; record-breakingly small energy consumption – less than 1 kW of electric power on 1 MW of generated thermal energy; minimum start time (just a few minutes); very high speed of power adjusting (several seconds); very wide range of power adjusting – from 10 to 100%. Main defects of the technology are following: bad efficiency or even impossibility to operate on fuels with high ash content because of blast cracks blocking on furnace grate by close-burning ash fragments; middle operational time of lining-up because of its rectangular section. This technology allows to burneffectively all types of biopropellant, except pulverulent. However, application of this technology for incineration of refined fuels makes sense only if fuels with high ash-content and low temperature of ash agglomeration are used (incineration of refined fuels with low ash-content is economically more effective on an immobile furnace-bar grate or in a vortex). Combustion chamber, as a rule, is parallelepiped-shaped. Furnace bars are set in cascade order (as a tiled roof), so every next furnace bar partialy covers previous one. Thus rows of furnace-bars are split into movable and immobile ones. There are nozzles between furnace-bars in vertical and horizontal planes, air blowing into the fuel layer and underneath is performed through these nozzles. Movable rows of furnace-bars, moving forward and backwards on immobile furnace-bars, push off fuel mass to the bottom of grate and poke it, this substantially improves burning effects for fuels with lowered calorie content and (or) high ash-content. Movable furnace-bars are operated by special drive, as a rule, hydraulic-powered. Traction mechanism usually provides possibility of frequency adjusting of furnace-bars recurrently-forward motions, what results into adjusting of grate productivity. Fuel is delivered by conveyer worm or hydraulic pusher on a topmost furnace bar. Under pressure of continiously moving portions of fuel, it moves sideway and to bottom, filling all the surface of furnace bars. Direction of air blast motion coincides with direction of fuel motion, due to what air also assists transferring of fuel towards necessary direction. In most top-quality and high-technological combustion chambers there is a special tight-fisted screen from fire-resistant material, able to work at temperatures up to 1650 °С, above the sloping surface of furnace-bars. This screen directs flame from top to bottom, in opposite direction to fuel motion. This method gives following advantages: flame makes longer way, providing more complete combustion of fuel mass; amount of sparks is diminished; flame, rising above moisted fuel mass, dries it out a little, thus improving incineration process. Advantages of technology of incineration on a movable sloping furnace-bar grate are following: possibility to operate on fuels with low energy density, high humidity and ash-content, low temperatures of ash agglomeration; high stability of incineration process with difficult fuel types; high ecological indexes of incineration process, that is especially important for utilization of difficult and highly polluted fuel types. Disadvantages of the technology: middle complexity of heat generator engineering design, plenty of moving parts, correspondingly, high price and longer recoupment time; large footprint and mass of equipment; large time of equipment launch and stop, relatively low speed of power adjustment; running expenses are higher than average; middle operational life of lining-up because of its rectangular section. It is more technological method of incineration of hard biopropellants. As a rule, it is used for incineration of small-fractioned fuel (particles size is up to 6 mm), including pulverulent fuels. According to the method, major part of fuel mass is located not on the furnace grate, but rotates around in vortical stream of air, i.e. it is a method of fuel incineration in self-weighted state. Incineration in vortex chambers ideally fits for dry wooden sawdusts and shaving, polishing dust, fragmented straw, husk of sunflower etc. Varieties of this technology: incineration with horizontal axis of vortex rotation and incineration with vertical axis of vortex rotation. Combustion chambers mostly are cylinder-shaped. There are tangential blast nozzles located on internal surface of combustion chamber. The blast air forced by ventilators through tangential nozzles gets into burning zone, creating vortex motion of air and fuel mixture. Particles of fuel here are in suspended state: they flow in air, moving with maximally protracted trajectory. Centrifugal force, which emerges here, pushes particles of fuel to internal burning hot surface of combustion chamber, assisting with more complete combustion and preventing bearing-out of unburnt particles from burning zone. Fuel mass is delivered in burning zone with horizontal axis of rotation also tangentially, and for heating zone with vertical axis of rotation fuel can be delivered into discharging zone on vertical axis. Advantages of vortex incineration technology: maximum simplicity of heat generator and minimum quantity of moving parts, correspondingly, lower price and shorter recoupment time; high intensity of incineration process, correspondingly, the equipment occupies smaller area and has relatively lower mass; minimum running expenses; shorter time of equipment launch and stop, high-rate of power adjustment; very wide range of power adjustment – from 10 to 100%; maximal operational lifetime of lining-up because of its cylindrical form (warranty is up to 8 years); high multipurposeness, which allows to burn hunch, firewoods etc., with addition of corresponding gas-rings heat generator can operate on gas or diesel fuel (as an alternative option). Lacks of this technology : high energy intensity; bad operational efficiency on fuels with high humidity and ash-content (but only with low temperature of ash melting) because of coverage of heat generator internal surface with close-burned ash; complications with close-burned ash removing. Pyrolytic caldron is a variety of solid-fueled boiler (as a rule, hot-water boiler), where fuel mass (for example, firewoods) and evaporated volatile substances burn separately. Usually “gas-producing caldron” term is used as a synonym, sometimes distinction can be made. Actually, pyrolysis (decomposition and partial gasification under effects of heating) takes place at any method of incineration of hard organic fuel. Pyrolytic caldrons are effective on fuels with the high output of volatile compounds: wood (firewoods, woodwastes, fuel preforms and pallets), brown coal; some caldron models consume anthracite coal ( “nut 1” class or “stone” class) and even coke. This type of caldrons imposes quite high requirements to fuel humidity, no more than 20-35% for firewoods. This is due to the fact, that aquatic steam dilutes pyrolytic gases and interferes with burning (see below); when working with moist fuels, power can sharply fall down or a caldron completely shuts down. In situations, when there is no dry fuel, it is quite serious problem. In pyrolytic caldrons, combustion chamber is divided into two parts. In the first part (also called gas chamber, or loading chamber) fuel burns and pyrolyzes slowly at the lack of oxygen, and gases evolved here burn out in the second part (so called combustion chamber), where secondary air (double blowing) is delivered. Heat dissipation from the loading chamber is minimized. In existent constructions these spaces are divided by a furnace-bar grate, where fuel mass lies; primary air flow passes through layer of fuel from top to bottom. Thus, the distinguishing feature of pyrolytic caldrons from other domestic caldrons is overgrate blast. Chambers of such construction have enhanced aerodynamic resistance, therefore traction is, as a rule, forced. Often because of technological considerations it is performed by means of induce-draught fan, but not blow fan (more typical for small caldrons); however, “ventilator” is a term, commonly used in many articles. Firewoods (or another fuel) are loaded on a furnace-bar grate. They are set on fire, chamber door is closed and induce-draught fan starts. At the lack of air and under effects of high temperature (200-800 °C and higher) charring and emission of wooden gas can be monitored, that is actually pyrolysis. 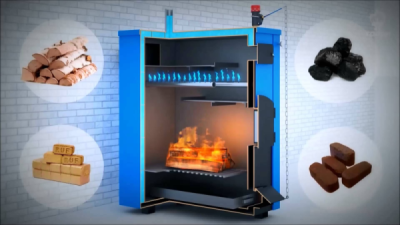 The evolved products (mainly hydrocarbons, carbon monoxide and hydrogen, plus nitrogen from primary air) are delivered under furnace-bar grate. There secondary air is mixed together with products of pyrolysis to make volatile substances burn out; part of heat here goes back to the lower layer of firewoods and thus supports pyrolysis process. Generated heat can be used for heating of any heat transfer agents, primarly water and air. Main competitors of pyrolytic caldrons in the field of firewoods incineration are traditional caldrons with single chamber and lower blowing. It is necessary to consider, that many modern caldron models also have a feature to deliver secondary air into fire torch (in some older caldrons all air flow was given under furnace-bar grate, so volatile substances could burn not completely. Ordinary range of caldrons load is 50-100%, efficiency ratio is kept at 85-92% level; unloads up to 30% make operations possible, but producers do not recommend it often. Advantages of this technology : process of burning (managed by primary air delivery) allows to work from one full load long time enough, up to 12 hours (ordinary wood caldrons make it about 3-4 hours, however overhead burning caldrons show even more operational time: from 30 hours on firewoods to 6-7 days on coal), it is possible to provide automatic control of parameters; complete combustion of fuel – as a result, economically effective burning is assured, rarer necessity to clean ash-pit and gas pipes; two-stage incineration allows to bring down surplus of air in leaving gases (promotes economical effects); process of burning of pyrolytic gases can be easily managed and regulated, that allows to automatize work of such caldron approximately to the same degree, as work of gas fuel or liquid-fuel caldrons; decrease of harmful substances emissions in the atmosphere (in particular, high temperature in overhead chamber represses CO emission); application of this type of caldrons stimulates to abandon use of undried fuel, that promotes management efficiency; possibility of incineration of large (even unchopped) firewoods; as a result, economical effectiveness of this type of caldrons, compared to “traditional” caldrons, can be 4-7% better. Lacks of this technology: operational costs are 1,5-2 times higher; energy dependence – caldrons can not operate without induce-draught fan; high demands to fuel humidity; output power changes were noticed at some caldron models, when volatile substances output initially increases, then minimizes during load pyrolysis down to 40%; on small (below 50%) loads burning is not stable, formation of tar can be detected in gas pipes; reverse water temperature must be not less than 60 °C (rarely 40°) in order to avoid condensate fallouts in gas duct and low temperature corrosion (this is ordinary requirement to caldrons, the problem is easily solved by mixing of direct water to reverse flow); it is impossible to organize self-feeding of fuel in a wood pyrolytic caldron (large firewoods are needed); at the same time there are pallet pyrolytic caldrons; considerable part of publications about pyrolytic caldrons has definitely expressed advertisement character, so it is problematic to form the objective opinion about them sometimes. Rentechno company offers transition services to make traditional grain dryers, working on diesel fuel or gas, into operation on cheaper types of fuel, such as straw, wood chips, pallets or peat.